Dad On the Run: Scary technology or just more fear mongering? Scary technology or just more fear mongering? As a former private investigator, part of me is very interested in this and how useful it might be to those searching for fraudsters, missing persons and criminals... the parent in me is somewhat concerned about this. How worried should we be though? After all, we are just a needle in a stack of needles these days and shouldn't have any real worries (beyond those parents have had since the dawn of civilization anyway). With that said, I did disable the automatic location services on my smart phone and don't allow it to tag location info on my photos, but I did that when I set up my phone not as a result of this story. It is worth noting the media's handling of this by pointing us toward websites and apps that can help with stalking endeavors seems a little counterproductive... as is my spreading of the message I suppose. Anyway, lesson to be learned here... know your setting and don't allow your devices to spy on you and reveal information that you would not put out there knowingly. As a guy who spent nearly 10 years looking for and watching people (insurance fraud suspects) who all thought no one could possibly be watching them or care about what they are up to, I think it is prudent to be aware of your digital profile and the profile of your children. Most modern digital cameras do not automatically add geolocation. There is a large exception to this rule: Smartphones. With the proliferation of smart phones that contain GPS locator technology inside, the cameras in these devices are already equipped with the specialized hardware to automatically add geolocation information to the pictures at the time they are taken. Most people don't realize that the action of automatic geotagging takes place on their smart phones... as a result, individuals often share too much information about their location, right down to the exact Latitude and Longitude when snapping photos with their smartpphone and posting them online. I didn't find any credible information in my research for picture (or location services: foursquare, Facebook check-in, etc) to indicate there is much crime taking place as a result of this information being shared, but I do think it is just a matter of time before a more sophisticated criminal arises. I'm not scared and am not indicating any of you should be, but it's good to be aware of these things so you can take precautions. This site is a great resource for information: http://www.eff.org/wp/locational-privacy it is worth noting I found their link through a site called pleaserobme.com which pointed out how "checking in" somewhere sends a clear message that the one place you are not is at home. Personally, I'd rather the criminals take my stuff when I'm not home so no one gets hurt; however, advertising when you are not home is probably just asking for trouble. It has even be suggested by some that usage of location services (fourquare, buzz and even facebook with check-ins) could ultimately lead to higher home insurance premiums for users if/when it is correlated to increased burglaries. Seems a little weak to me at this point, but if you want to play it safe and avoid the possible extra costs, check out some tips here. 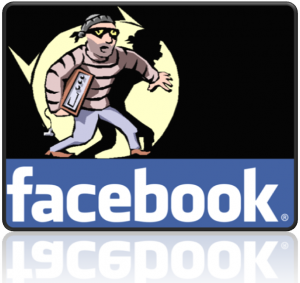 Of course, we must also remember Facebook has led to the arrest of criminals in some cases. So while offering up too much location information could lead to robbery/burglary... it could also lead to arrests of criminals. Check out this story about a 19 y/o who couldn't resist checking his Facebook account while burglarizing a house and was ultimately caught as a result... D'oh! Interesting and thoughtful. Thanks for posting. Thanks for stopping by PH.Daddy!